It’s a good thing that my dining room walls and trim are taking way longer than I had anticipated, because I’ve had a heck of a time narrowing down all of the options that I’ve considered and shared into one cohesive design plan for this room. But it’s really down to crunch time, and a decision needs to be made because I need to get fabric and drapery hardware ordered ASAP. After many people telling me that my striped drapery option for my dining room wasn’t right for that room, I started doubting my decision. I knew they would be very bold in the room, which is why I had decided only to use them on the fireplace wall, and just use Roman shades on the front windows. But the more I considered them, and the more comments I read telling me that they were the wrong choice, the more I started to see what so many of you were seeing. Plus, it’s strange that I, a person who loves draperies so much and wants them on ALL of the windows, would consider leaving them off of the main windows in my dining room, right? 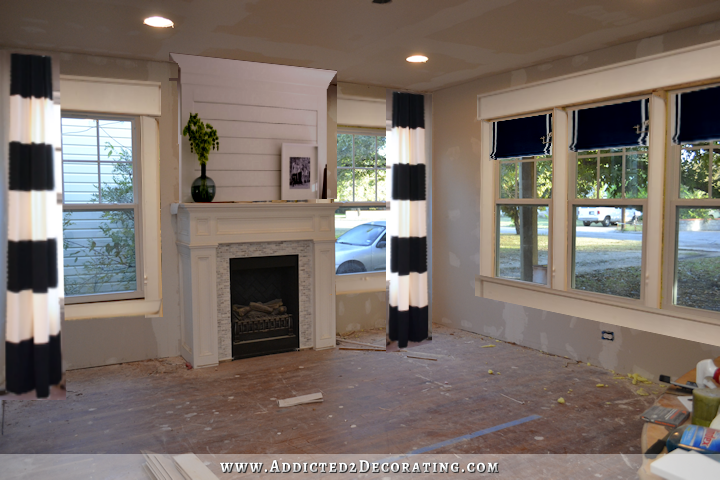 Even if the striped draperies on the fireplace wall turned out looking fabulous, I think I would have regretted only putting Roman shades on the front windows and not having draperies on those windows. So I went back to the drawing board. And for the record, I’ve also ruled out two other options that I considered for the room. First, a black fireplace. As much as I love black and dark charcoal fireplaces, this option just hasn’t felt right for my particular room. My room is small, and I have 8-foot ceilings. A black fireplace just seems like it might be way too imposing in the room. To be honest, the idea of a green fireplace was my favorite. It’s different and eye-catching. It’s bold without being dark and imposing. And I love green. But in the end, I ruled it out, too. My kitchen is green, and I think it’s gorgeous and fabulous. While I do want to bring that green into the dining room somehow to make the rooms cohesive, I think painting another LARGE item green is out of the question. The more large things I paint green, the less unique and special that green looks on my kitchen cabinets. I’m okay bringing that color in with fabric, but not on any more painted items. So my fireplace will be white. I think a classic, clean, bright white fireplace is the best option for my room. And that brings me to my two new window treatment options. After looking at every single fabric (in stock and special order) at both Hancock Fabrics and JoAnn Fabrics and not finding even one single printed fabric that I liked for draperies, I decided to stick with my absolutely favorite, tried and true, linen fabric in a solid color. 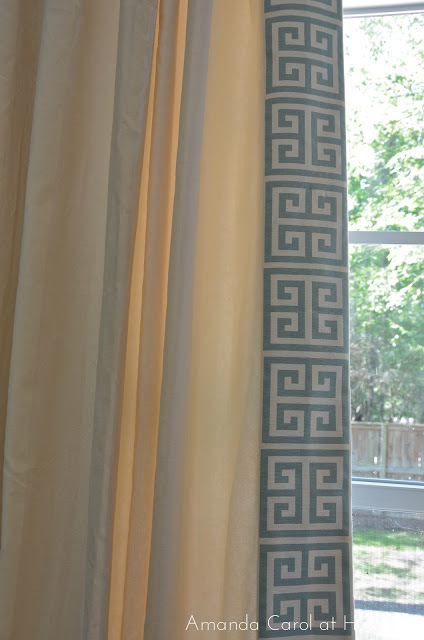 And to bring in that bold pattern that I wanted (that I was trying to achieve with the bold stripe curtains), I’ll use a black and white Greek key accent along the leading edge of each drapery panel. You get the point. 🙂 But white and cream draperies, as beautiful as they are, just really aren’t me. I want black or green, and I think that that the black and white trim will look great on either one. So those are my two options, and this decision has consumed my mind for so long that I’m really not willing to even consider anything else at this point. It’s going to be one or the other — either black or green–and I just need to make a decision. I love the green because, well, green is my favorite color and I think it breathes life into a room. My concern is that it’ll be too much of a good thing — and entire green kitchen right next to a dining room filled with green drapery panels. Plus, I think if I did the green drapery panels, then I’d have to go with a neutral wall color, and we’ve already discussed my issue with light neutral (other than white) wall colors. So at this very moment, I’m leaning towards black. I think it will look fantastic with the black and white Greek key trim, plus it will complement my black and white music room very nicely. On top of that, black draperies won’t force me to use a light neutral wall color. I could still use the super light green color that I want, and it would also look great with the bright and bold dining chair fabric I’ll be using. And the black also won’t compete with the coral buffet in my entryway the way that the green curtains might. Now I just need to get all of this wall trim finished. It’s starting to feel like a never-ending job. Go with your gut Khristi. Order the black. All of the samples that you show have the same colors in the Greek key as in the draperies so I think it will be sharp. I like the green. Great idea using the fabric Greek key. So much easier. I say black, then you can do your green walls and you get the best of both worlds! Black! I love the combo of the black with the black and white trim! It will look amazing!! I already bought the Greek key fabric. I had a much easier time making that decision than deciding on anything else for this room! 😀 I did consider some painted options, but I’m not sure how well that would hold up to dry cleaning in the future, and I definitely want something dry-cleanable. I’m so glad you talked yourself into using the black. As I was reading the post it just seemed right to go with the black. Can’t wait to see the next step. Blessings for your day. I say black, too, for the drapes. But personally I think the walls should stay white. I’m sure it will be beautiful either way. IF it were my house, I also would keep the walls white, and perhaps continue trying to find a subtle print for draperies, but Kristi has a different vision and I totally respect that. I often need to talk things out to clear my head. So, I get that writing about this decision helped you make the right one. I am glad that you chose black. Every room need that anchor. And green is a hard color to match. 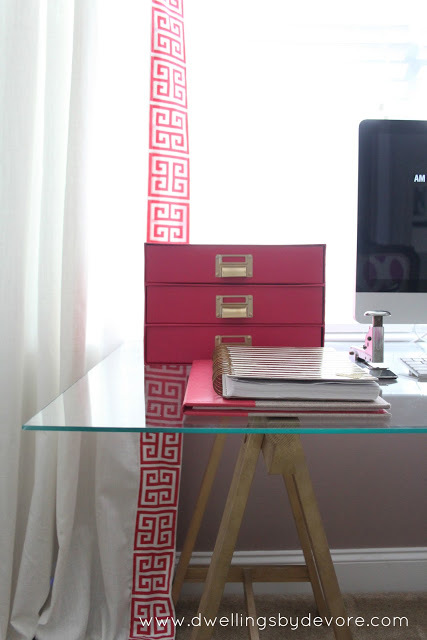 So having it as accents in the room with your Coral buffet will be beautiful! I honestly love the striped curtains and I also LOVE the green fireplace. I’m going through a navy and green spell myself. My husband and I are getting ready to have a DIY Valentines Day weekend together redoing our living room with these colors and of course white. 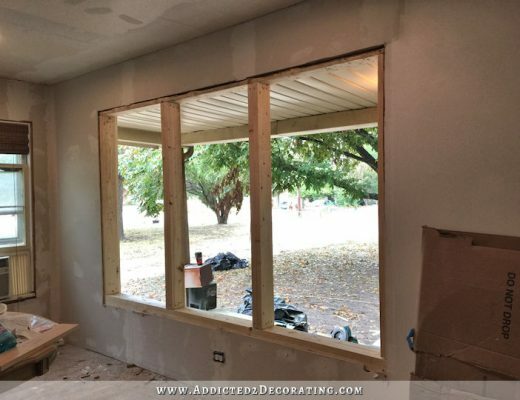 We’re doing board and batten through the living room and long boring hallway/entrance way. That will be white and then we are doing a navy on the upper portion of the walls. I can’t wait! I love how you weigh your options all the time. I know, from personal experience, that it’s hard to commit sometimes to the “pretty” things in the design of a room. But go with your gut! It’s your home and make it how YOU want it. I can’t wait to see the progress continue. A DIY Valentine’s Day sounds lovely! I should have suggested that to my husband. I got Kristi’s miter saw for Christmas and already know that the mason jar spray gun is coming for Valentine’s Day. Secretly hoping for the orbital sander, too! Keep leaning towards black linen curtains Kristi. I think that they will look sensational in your dining room with the colorful chair fabric, plus they will maintain the green kitchen’s uniqueness. Then black it is! 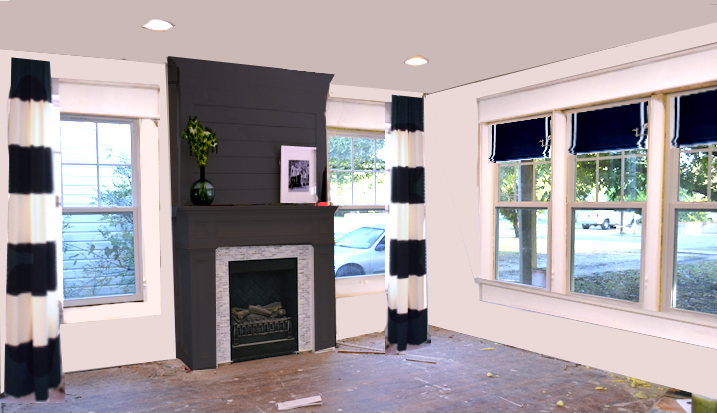 I love the idea of the crisp white fireplace, black drapes and black and white trim. Pair that with the lovely green walls and you have a winner. I’m so glad you decided to go with all white on the fire place. I really think you should wait to paint your walls until you have at least two curtains completed. When you place them in the room along with the gorgeous dining room fabric spread out, it will give you a better sense of what color walls will enhance and really work with those two bold beauties. May we see ALL of your Dining Room “stuff” together in one picture? (i.e. the light green paint on a stick, the captain’s chair fabric, the coral buffet, etc.) Actually, in two pictures…one with the green window treatment fabric and one with the black? I can’t visualize everything you are doing anymore! 🙂 Whatever happened to that green fabric that you were once going to use on the edge of your drapes? It kind of had the same pattern that your sliding doors have. Are you going to use it somewhere else? Or is it still going to be used somewhere in your dining room? Everything looks gorgeous! I just want to see it all together! Thanks!! I second this idea (about seeing all of the details together)! Sorry to rain on your parade, but I don’t like the idea of black drapes at all. It will make the room way too dark. I thought you liked light and airy. But, I’m sure whatever you choose will be beautiful. I really, really enjoy your blog and think you are amazing. Keep on working on that room, can’t wait to see it all done. While I will mourn the loss of your striped window draperies and Roman Shades, I think the black will look good with the trim, the lighter green walls and that pretty chair fabric. Kristi…I hope this is truly your gut, and not letting people get to you again. I love the black drapes, white fireplace etc, but, bottom line…it is your house and you live with it. Go with what makes you happy! My vote is for black curtains with the Greek key trim. The green accent will already come from your chair upholstery and the black with also tie in with music room. I agree with using black fabric, not green. I could also envision a pristine white linen drape bordered with an eye-popping green Greek key design. Love love love the black with the greek key trim!!!! Will be a sharp look with the walls, whatever color you choose to paint, and the other fabrics in the room. Go with your heart! My opinion is the green would take away from your awesome kitchen. Would you consider Roman shades on the fireplace wall? I think it might lighten it up in there. Good luck, can’t wait to see what you do. I personally like the green the best. I think the black would make the room to dark, but this is my opinion on it. I would go with the green with black trim or even find a fabric that is coral and use the black trim with it. I love black, but not on curtains. I think it would shrink the size of the room down. I think that in combination with the greek key pattern, the black is much better suited as it matches on of the two pattern colours. As a fan of black, that would have been my choice, anyway, even though I could see the temptation of the green fabric. however, it’s only drapes and if you don’t like them after a while, you can change them fairly easily! I think that also in combination of what you have planned or done for that room already, black is a great choice, because it’s kind of neutral thus matching the coral buffet and the patterned fabric for your chairs and allows you to go with your pale green walls which I cannot wait to see executed, I like that idea so much! Just found your blog and I love it! Definitely white walls, green curtains with black and white key detail and keep the roman shades! Layering window treatments is perfect for a formal dining room! Good Luck and no matter what you decide will be awesome! I always agree with whatever you say (kinda like a good husband)….so black is best! Can’t wait to see them up! I like the idea of the black draperies with the Greek key trim. I think it will look stunning. My concern would be at night, when you have them closed, that is a lot of matte black surface area that won’t be reflecting any light back into the room. Perhaps it won’t be an issue since this is a dining room and won’t require even lighting throughout. I am not sure I get it. What was wrong with your striped drapes? Why couldn’t you put them on all the windows? I think that would have looked wonderful. Or with the roman shades? Again, wonderful. You were able to get your dark and light and airy in one swoop. Go with what you want and not what people are saying. I am just curious Kristi – wouldn’t the black curtains be imposing in the same way as a black fireplace? The total area of the curtains when opened is about the same of the area of the fireplace. If closed, the black area would be even bigger. Love all your ideas…from the first round last summer to the current one. The Greek Key design is very cool! 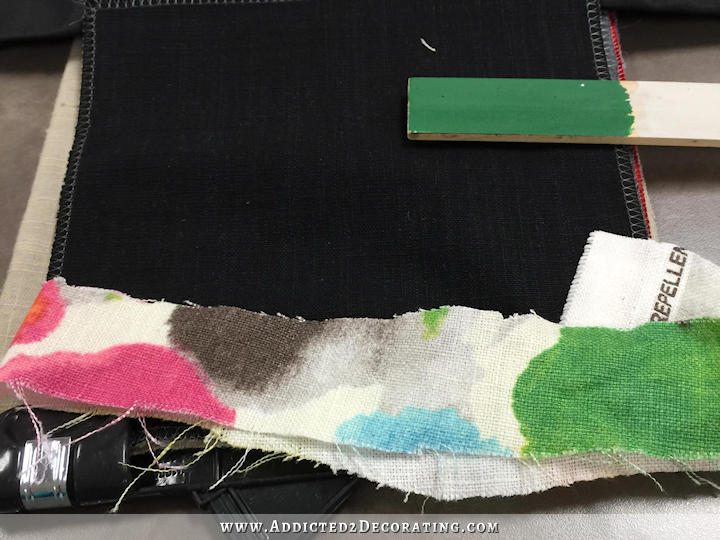 Not questioning, but wondering…last July you’d found a green fabric with a similar motif as your Music Room doors… is that out of play? Would look stellar on the black (as will whatever you choose)! 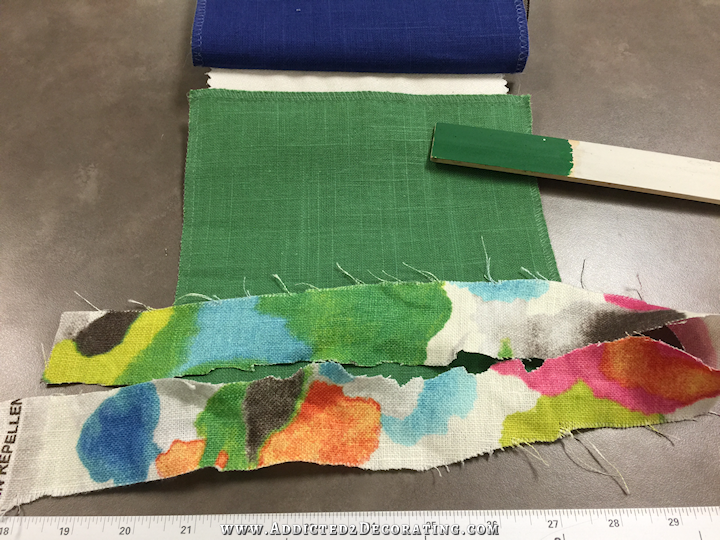 Have you considered ombré fabric? It gives you the black, without too much of it, it’s kind of a nice in between of stripes and solid with a softer look. How much sun comes into that room? Black will fade pretty quickly if a lot of sun. Also do you have hobby lobby? 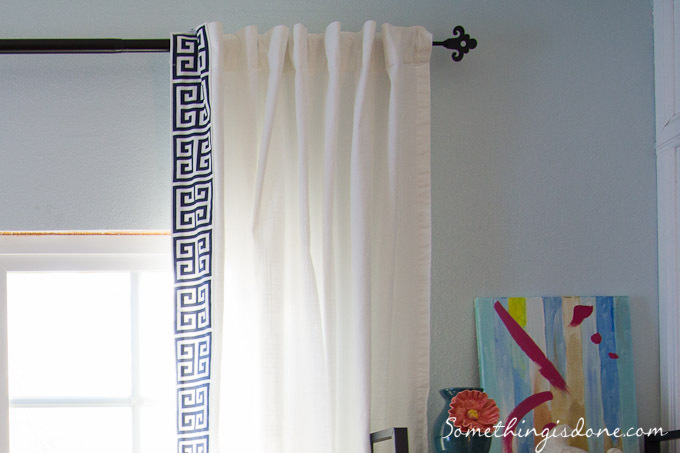 They have very inexpensive Greek key trim I added to some pottery barn linen drapes. I enjoy your adventures and look forward to the reveals! Good point. Fading is a problem. Kristi do you have any plans for protecting your investment from sun bleaching? It’s always nice to read your thought processes as you plan or revise a plan, Kristi. Your professional eye and point of view are alway interesting. I’m glad you abandoned the idea of the striped curtains. I felt the room would have too much weight on one end. And I agree completely that the featured front window shouldn’t be shortchanged. I am a bit concerned that the black draperies might weigh down the room as other readers have mentioned. I’m trying to imagine the scale of the other elements in the room against the black fabric. I imagine they will be open most of the time, so perhaps not too imposing. 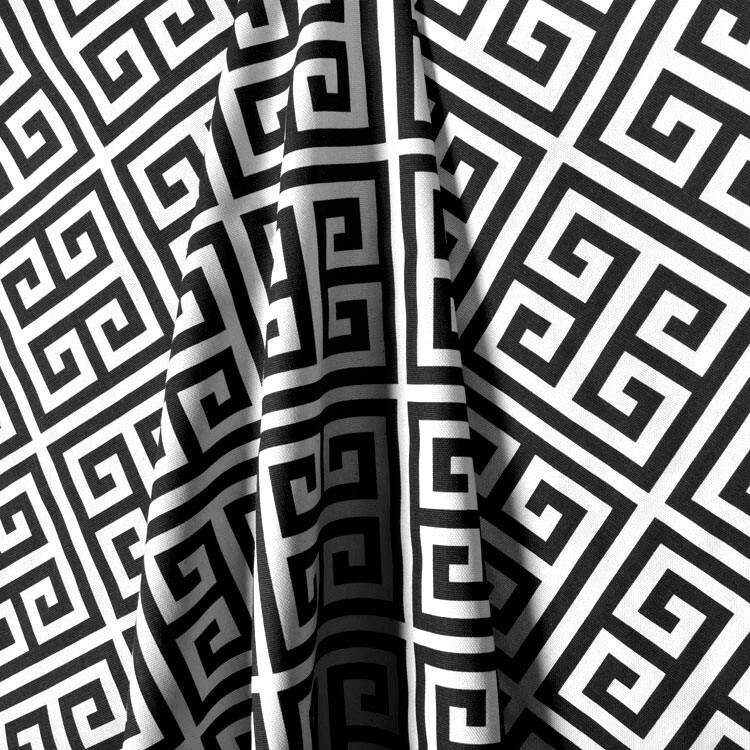 The Greek key border from print fabric is inspired! I absolutely love it. Luxe for less! Can you do blind stitching with your sewing machine? Love it! So glad you are going with the black linen. Fabric and paint aren’t the only way to bring green into the room – use plants! I’m always amazed at the transformation a simple plant or tree will make. It is going to be fabulous. You know how to balance everything just right so that it looks wonderful. Have fun with it! Go for it. Cannot wait to see the results. What is the name of your chair fabric? Oh! I really liked the black and white striped drapes (and the Roman shades on the front windows). Am sorry to see them go. My only concern with the black linen would be the prospect of it fading in the sunlight. Just going from clothes that I’ve owned, black can fade easily – don’t know why. But your ideas will all look beautiful. I would have stuck with the black and white striped curtains! They would be both classic and dramatic! If you google images of them in dining rooms I dare say you will love them. lol…. I think the people who didn’t care for them, couldn’t get pass the image of a unfinished room. If they saw the finished room, it probably would change there mind. I wouldn’t want to be a blogger and have to read all the different comments, they would make me doubt my choices!! Hope everything turns out fantastic!!! Love the black curtains with trim, white fireplace and pale green walls!!!! I like the black. It’s classic and goes with anything. It also allows you to change your color scheme whenever you want with the paint and other accessories, yet still look fabulous. My advice is to go to a store that sells pre-made curtains and get a pair in black to hang, just to show yourself how great they look. You can quickly return them and get a refund. I agree, the black linen will be most complimentary. I’m so excited to see this come together! Have you considered doing decorative cornices in your dining room? I can just imagine how beautiful that would be with the Greek key. Could even add gold nailheads if you wanted to be fancy. Loving the choices you are making. White linen with black and white key edging is my choice. White is lighter, won’t fade and will make the room feel bigger and airer. Use black on the wing chairs and print on the dining room chairs with wood table and floors. I think purchasing black drapes may be a good idea to try it on for visual effect. I am concerned that the dark fabric whatever color is going to make this corner of the room very weighty in comparison to the other side. An ombré fabric might be option but of course it will have grays in the middle. I actually was beginning to love the stripe drapes as long as the neutral in the stripe was the same color as the neutral on the walls. So hard not to be there and visualize it all together in person. Love that the fireplace is going to be white because it shows all the beautiful work you have put into it. Please , please , think carefully that your decision is yours and not influenced by our comments. So many times the joy can be sucked out of something we love by comments from others. Just my two cents is finish your room minus drapes ( since they are so expensive to do over) , prime walls, Paint trim ,bring in finished dining table with chair fabric , buffet, and major artwork then decide on drapes, wall color, and rug. Wishing you a light bulb comes on, non stressful ,bam this is it choice for this room. I just read all of the comments. I really enjoy hearing other people’s vision and perspective, do you? When your fans (yes, we are fans) comment about the drapes being wrong, or the color of the wall being off…. how do you give those opinions ‘weight’ if you haven’t seen their canvas(home)? We all are so wonderfully and uniquely created that no two homes should be the same. Don’t second guess yourself. I agree with another poster when they said to wait. 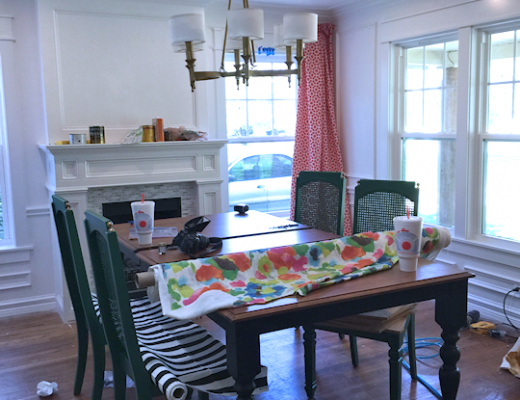 Finish the table, fireplace, chairs, then work on drapes. It WILL unfold. Continue being your awesome self sister! I too love the idea of the black and white and think it will tie into your music room beautifully. Can’t wait to see it all come together! Kristi, I think the black draperies will weigh the room down. A soft off-white with the greek-key band will work very well without competing with your upholstery fabric. You can bring the green into the room with accent pieces. Just my two cents’ worth. Not that you need it, but I affirm your choices. 😊 I think the black drapes will look great and when they’re closed, it’ll give the feel of black walls, without the commitment. I think it’ll be awesome — classy and classic. so glad you’re headed toward the black option… I loved it at first sight! …but I’ve come to the conclusion that I would and will really like any final decision(s) you make! I love the Greek key fabric. I would consider that fabric for the window treatment. I’d also do Roman shades instead of drapes. I can tell you from experience that black drapes will fade a lot from the sun. Ultimately, it is your home, so do what speaks to you. I admire your skills and abilities. 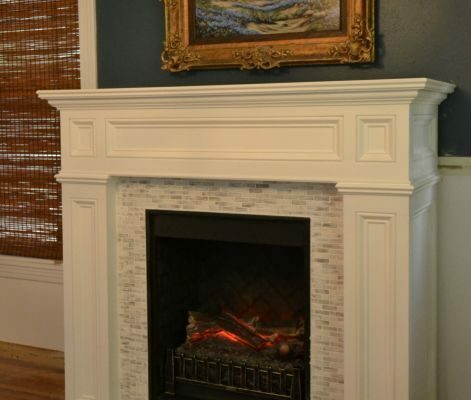 I loved the green fireplace, but understand why you chose to go with white. I think the fabric you have chosen for the chairs would make fabulous drapes. My favorite color… any shade as long as it is green! It really doesn’t matter what us readers think will look good, it only has to be what you and your sweetie love. While the black and green are stunning, perhaps wait to finish them later? The construction dust will really be noticable on those lovely drapery panels. I am sad to see the striped curtains go! I think they would have been lovely on the fireplace windows, especially with the white fireplace, and on the front windows as well. Pale green walls, the printed fabric…all so classic with a colorful punch! I am having trouble understanding/ envisioning how the black with black & white key design will be different. I know you will work it all out & make it beautiful. I will be watching & waiting! I like either color but think that which ever color you use you should pipe either side of the Greek key border in the other; especially if you choose the black. Black with the Greek key will look beautiful.